PDFTiger is a comprehensive, easy-to-use Word To PDF Converter and PDF To Word Doc tool which is designed to create PDF documents from Microsoft Word, Excel, Powerpoint, text or images. In addition, the PDF tool can also converts PDF files into an editable MS Word Documents, Rich Text Documents, Plain Text Files, Images, HTML Files and Shockwave Flash SWF Files. 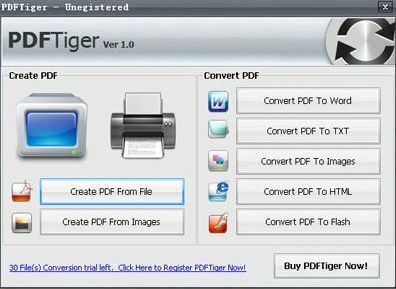 With PDFTiger, users are allowed to perform wide variety of conversion scheme including Word to PDF, PDF to Word Doc, PDF to JPG, Excel to PDF, PDF to RTF, PDF to BMP, PowerPoint to PDF, PDF to TXT, PDF to GIF, TXT to PDF, PDF to HTML, PDF to TIF, Images to PDF, PDF to SWF, and PDF to PNG. PDFTiger normally priced at $39.95 per single license. But now interested users are entitled to download the full version of PDFTiger for free, thanks to the time-limited giveaway promotion. This promotion will be ended on October 21. To grab the free copy of PDFTiger, you need to download PDFTiger’s setup installer from here . In order to activate the software, you need to input the provided registration code – R8Z8682LMDUAKHW. You can visit http://www.pdftiger.com/giveaway.html to know more details of the giveaway promotion. PDFTiger is compatible with Windows Vista, 2000, ME and Windows XP operating systems.